LAST Tuesday saw the best of the South Indian beauty industry heading to the Beautypolis Achievers Award at Chennai Trade Centre. Around 90 stalls were seen at the venue, including Max Factor, Balamain Hair and others. Beautypolis, the online portal for all things beauty a�� from product reviews to make-up tutorials a�� was launched last October in Mumbai and is headed by Aashish Rego (42) and Allen John (40). a�?The beauty industry in India is booming. The hair care market itself is worth `4,000 crores and is increasing at a minimum growth of 20 per cent per annum. We provide a platform that links those with a primary interest in the beauty industry a�� from manufacturers to fashion bloggers,a�? says John. The event saw celebrities like stylist Joy Crizldaa, regional film actor Ganesh Venkatraman and wife, Tamil actress Nisha Krishnan. Speaking about entrepreneurship CK Kumaravel, the owner of the Naturals beauty salon chain, adds, a�?By helping one person set up a salon, you cannot set up a franchise. When you enable that one person to set up multiple salons a�� thata��s when you are really successful.a�? His wife and co-owner of Naturals, Veena Kumaravel picked up the a�?Achievers of the decade awarda��. Pattanam Rasheed, with 35 years in the regional film and make-up industry, was given the a�?Legend awarda��. a�?Most of the youngsters are in the profession for the love of it, and if they are backed by technical know-how as well, the future of the make-up industry looks very bright,a�? he concludes. The New Indian Express was the print partner for this event. According to the recipient of emerging artist of the year 2015 for make-up, Sridevi Ramesh, the Arabian look is much in demand these days. a�?Details like smokey eyes, heavy contouring and messy hair completes the look,a�? says the bridal make-up expert based in Chennai. She swears by lip colours like red or even orange if you are in the mood to experiment. Gopinath got into hair-styling in 1996. More recently, he had the chance to explore his skills by working in the Oscar-nominated movie, Life of Pi, as well. a�?Hair extensions are a good option to provide instant volume. Colours trending right now are blonde and browns,a�? 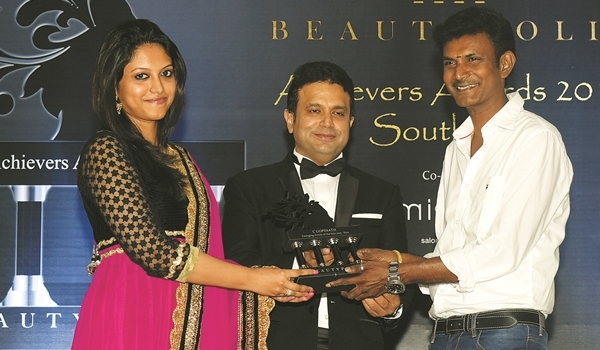 says the Chennai-based hair expert who won the a�?Emerging artist of the yeara�� in the hair category. Comparing hair textures, Goodapati, founder of Mirrors salon and spas, Hyderabad, admits, a�?North Indians have fine hair, which is easier to deal with when compared to the hair texture here, where each strand is thick.a�? She also pinned down the look of the season as messy. a�?It is favoured by college-going girls and at red carpet events alike,a�? says the winner of a�?Achievers of the decade awarda��. While Selvaraj swears by Label M products (from Toni&Guy), a�?because they are organic!a�?, to add instant shine to your hair, La��Oreala��s Keratin range would be Goodapatia��s pick. Both Sridevi Ramesh and Manjul Gupta prefer Bobbi Brown when it comes to lip colours, especially reds, while Gupta also recommends browns from M.A.C. With 30 years of experience, Bengaluru-based Gupta was one of the obvious choices for the a�?Achievers of the decade awarda��. She believes that people are more open to trying different hairstyles, especially when it comes to styles like the lob (longer bob). a�?Unkept braids are going to make a big splash this year,a�?A�predicts Gupta. The a�?Best hair extension experta�� winner from Toni&Guy, Chennai-based Selvaraj tells us that wigs go by a different name now. a�?They are called switches and are great for people who want to add more volume or are reluctant to cut their hair.a�? She also observes that fringes are the extensions inA�demand right now.